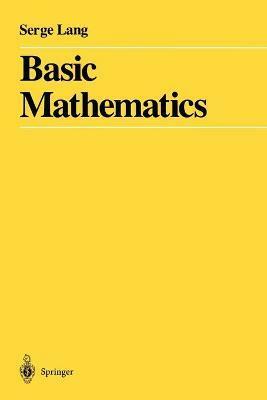 The present book is intended as a text in basic mathematics. As such, it can have multiple use: for a one-year course in the high schools during the third or fourth year (if possible the third, so that calculus can be taken during the fourth year); for complementary reference in earlier high school grades (elementary algebra and geometry are covered); for a one-semester course at the college level, to review or to get a firm foundation in the basic mathematics to go ahead in calculus, linear algebra, or other topics. 1: Numbers. 2: Linear Equations. 3: Real Numbers. 4: Quadratic Equations. 5: Distance and Angles. 6: Isometries. 7: Area and Applications. 8: Coordinates and Geometry. 9: Operations on Points. 10: Segments, Rays, and Lines. 11: Trigonometry. 12: Some Analytic Geometry. 13: Functions. 14: Mappings. 15: Complex Numbers. 16: Inductins and Summations. 17: Determinants.